If you are off-campus, you must use the Northwestern VPN to connect to a Research Data Storage Service (RDSS) share. If you are on-campus, you must use Northwestern's (or your school's) DNS servers in order to connect successfully. If you are on-campus and having difficulties connecting to an RDSS share, you may need to configure your DNS settings to use Northwestern's DNS servers. The firewall settings for RDSS also allow you to use your school's DNS settings. If you are interested in this latter option, contact your local IT department for more information on their DNS settings. In the search box at the top right corner, search Network and Sharing Center and click on the result. From the menu on the left, select Change adapter settings. Select Local Area Connection or Ethernet, and select Properties from the pop up menu. Click OK to close the Internet Protocol (TCP/IPv4) Properties window. Click OK to close the Local Area Connection Properties window. In the top left corner, click the Apple icon. Click on the network you are using, such as Thunderbolt Port, Ethernet, or Wifi. In the bottom left corner, under the DNS Servers box, click the plus (+) sign. Click the plus (+) sign again. If you are off campus, Northwestern VPN is required to connect to an RDSS share. It is not suggested to use VPN if you are on-campus. Open the Control Panel by pressing the Windows Key on your keyboard, typing Control Panel into the search bar, then selecting Control Panel from the search results. In the Control Panel, select Network and Internet > Network and Sharing Center. Select Connect to a workplace and click Next. If you see a screen that says "Do you want to use a connection that you already have? ", select No, create a new connection and click Next. In the Internet address field, enter vpn-nu.vpn.northwestern.edu. In the Destination name field, enter Northwestern VPN. Click Create. 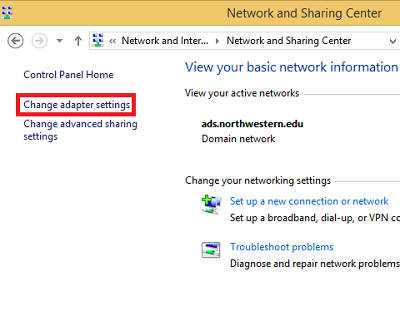 From the Network and Sharing Center, select Change adapter settings, right-click Northwestern VPN, and select Properties. Select the Security tab. 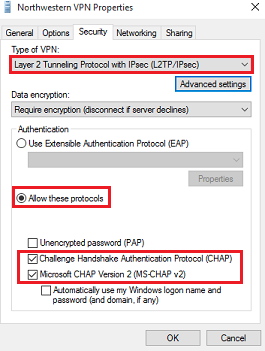 Set Type of VPN to Layer 2 Tunneling Protocol with IPsec (L2TP/IPSec). 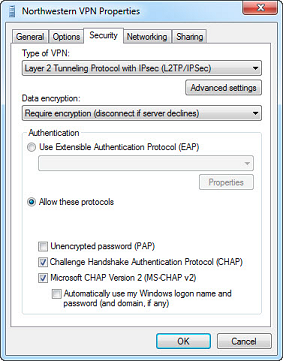 Check the Allow these protocols button, and ensure that Challenge Handshake Authentication Protocol (CHAP) and Microsoft CHAP Version 2 (MS-CHAP v2) are the only two selected. Then click OK.
Click the Advanced Settings button. Enter northwesternvpn as the Key. Click OK. In the System Tray in the lower-right corner of your Desktop, click the Network icon, then click on Northwestern VPN and click Connect. Windows 10: Enter your NetID as the User name and your NetID password as the Password. Windows 8/8.1: Enter ads\your NetID as the User name (e.g., ads\abc123) and your NetID password as the Password. Click OK. You should now be connected to the Northwestern VPN. Open the Network and Sharing Center by clicking Start > Control Panel > Network and Internet > Network and Sharing Center. In the Internet address field, enter vpn-nu.vpn.northwestern.edu. In the Destination name field, enter Northwestern VPN. Click Next. In the User name field, enter your NetID. In the Password field, enter your NetID password. Click Create. The connection is ready to use confirmation window will appear. Click Close. 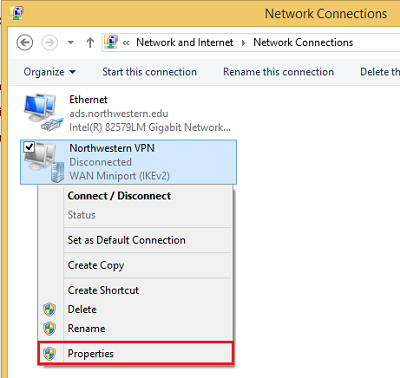 From the Northwestern VPN Properties window, select the Options tab. Under Dialing options, un-check Include Windows logon domain. Enter northwesternvpn in the Key input box. Click OK, then click OK again to finish the configuration. Note for members of Feinberg School of Medicine: Cisco AnyConnect VPN will not work on Feinberg-managed computers due to increased HIPAA security standards. If you cannot use the Native VPN for any reason, please contact Feinberg IT at fsmhelp@northwestern.edu. Type your NetID and NetID Password into the respective fields, then click login. Below the Welcome message, click Continue. Java may need permission to run. Click Run this time or Run. Follow the listed instructions to complete installation. If automatic installation does not work, you will be prompted to perform manual installation. Click the Windows Desktop link to download the manual installation file. Run the installation file and follow the on-screen instructions to manually install the AnyConnect software. After the AnyConnect client has been installed, open the AnyConnect software and, if necessary, type in vpn-nu.vpn.northwestern.edu in the blank bar, then click Connect. Enter your NetID and NetID Password and click OK.
Click Accept to connect to the VPN. Once Cisco AnyConnect is installed on the computer, you can launch it and connect by opening Cisco AnyConnect from the Windows Start Menu and System Tray. Click Advanced.... Check Send all traffic over VPN connection and click OK. Note for members of Feinberg School of Medicine: Cisco AnyConnect VPN will not work on Feinberg-managed computers due to increased HIPAA security standards. If you find yourself in a place where you can't use the native VPN client, contact Feinberg IT at fsmhelp@northwestern.edu. If you have not installed Cisco AnyConnect before, open a web browser and go to https://vpn-nu.vpn.northwestern.edu. In the appropriate fields enter your NetID and NetID password and click Login. At the welcome screen that appears, click Continue. If Java needs permission to run, click Run this time or Run. If prompted to allow the applet to run, click Allow. If prompted to do so, provide your computer's administrator credentials to allow installation of the AnyConnect client. If the connection was unsuccessful, you will need to do manual installation. Click on the installation link provided and open the .dmg file downloaded, then open the vpn.pkg file and follow the installation prompts. Once installed, if it does not open automatically, open your Applications folder and open the Cisco folder, then double-click Cisco AnyConnect Secure Mobility Client. If the software does not automatically connect, enter vpn-nu.vpn.northwestern.edu into the bar in the Cisco client then click Connect. If you use DNASTAR Lasergene, you will find that you can't use either Cisco AnyConnect or the native macOS client as configured above. The issue has to do with the type of VPN configured. We recommend you keep two VPN configurations on your Mac - one for general VPN access, and one to use when you want to use Lasergene.